Richmond, VA, located in east central Virginia along the James River, is one of the oldest cities in the United States. It was founded shortly after the settlement in Jamestown in 1607. The city, Virginia's capital, has seen a preponderance of history, including Patrick Henry's "Give Me Liberty or Give me Death" speech, the rise and fall as the capital of the Confederacy, and numerous battles during the Civil War. Today, Richmond is a thriving city of over 200,000 residents. It is home to the financial giant CapitalOne as well as Brink's Security and Circuit City Corporation. Famous past and present Richmond residents include tennis star Arthur Ashe, actors Warren Beatty and Shirley MacLaine, writers Patricia Cornwell and Thomas Wolfe, US Secretary of the Treasury John Snow, and recent "American Idol" finalist Elliott Yamin. Richmond was founded shortly after the Jamestown settlement as the early English settlers moved up the James River. The city grew to be an important 18th century city and Virginia's capital before it was moved to Williamsburg in 1780. The city was a hotbed of anti-royalist activity, including Patrick Henry's famous speech, which cultimated in the Virginia legislation sending troops to the Continental Army. In retaliation, the British burned the city of Richmond in 1781. Richmond quickly rebuilt following the Revolutionary War to become one of the leading commercial and cultural centers of the south. It was in Richmond in 1861 that the Confederate States of America was born, with Richmond as its capital and Jefferson Davis as its president. Four months later, the shots were fired at Fort Sumter that ignited the Civil War. Richmond suffered during the Civil War. In 1865, Union General Grant captured Richmond, leading to General Lee's surrender at nearby Appomattox Courthouse. The retreating Confederate soldiers torched the city of Richmond, for the second time in 100 years. The 20th century saw a vibrant and modern Richmond emerge, and that growth continues into the 21st century. The city is a major financial and governmental hub as well as home to several Fortune 500 companies, such as Circuit City and CapitalOne. Monument Avenue - Located in the heart of Richmond, this historic area is listed on the National Register of Historic Places. 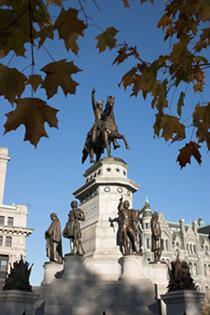 The scenic avenue is home to statues of Confederate heroes as well as famous Richmond natives. Statues include those of Robert E. Lee, J.E.B Stuart, Jefferson Davis, oceanographer Matthew Fontaine Maury, and tennis star Arthur Ashe. Museum of the Confederacy - Located two blocks from the Viriginia State Capital, this museum features a rich collection of Civil War and Confederate States artifacts and memorabilia and encompasses the former Confederate White House. The anchor of the ironclad warship, CSS Virginia is displayed on the front lawn. St. John's Church - St. John's Episcopal Church is the oldest church in Richmond. It was the site of the second Virginia Delegation in 1775, whose delegates included Thomas Jefferson and George Washington. It was also the site of Patrick Henry's famous "Give me Liberty or Give me Death" speech. Science Museum of Virginia - This fascinating museum, opened in 1977, is home to the world's largest analemmic sundial as well as the "Grand Kugel," an 8-foot 8.7-inch sphere of South African black granite. Other attractions include a planetarium, an IMAX Theater, and "Crystal World," the world's largest and most complete exhibit of crystallography. The Edgar Allan Poe Museum - The museum contains the world's largest collection of Poe manuscripts, writings, correspondence, and memorabilia. Poe was a longtime resident of Richmond and lived just two blocks from the museum. Hollywood Cemetery - A large, sprawling cemetery overlooking the James River, the Hollywood Cemetery is the final resting place of two presidents, James Monroe and John Tyler as well as Jefferson Davis, J.E.B Stuart, and thousands of Confederate and Union soldiers. Richmond, VA is an easy drive from other cities in Virginia including Williamsburg, Norfolk, and Roanoke. It's also easily accessible to Washington DC, Baltimore, and other east coast hubs. Accommodations in the city range from sleek, modern hotels to charming Virginia bed and breakfast inns.